Welcome to the UELAC Catalogue! The items in this catalogue each feature some representation of the UELAC. We hope you will enjoy wearing, using or displaying your selection, and satisfying the curiosity it is sure to arouse in others. The catalogue is divided into categories. Choose a category from the list below; alternatively, read our ordering information page or scroll down for the background on the UELAC promotions calatogue. NOTE: if branches buy pins or promotional items in bulk, there is a discounted rate (a branch fund-raising opportunity!). New UELAC logo'd clothing items have been previewed for the last while at some events. Some items feature the rugged look. These items are available now online, but only until July 12. See flyer. The intent is to have another ordering period later in the Fall. During this time, orders will be collected and then the goods will be made and shipped. Take advantage of this period to get free shipping right to your home. 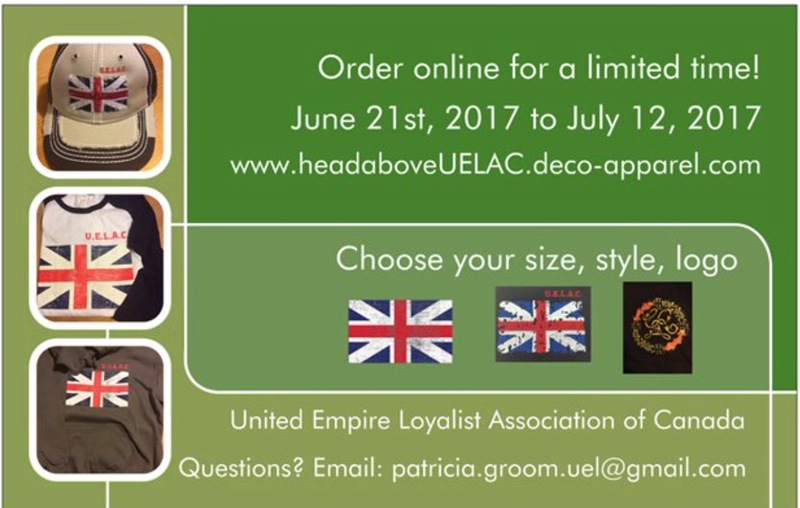 To order, visit http://www.headaboveuelac.deco-apparel.com/. There is a Contact page for item detail questions; for questions about the overall program, email Trish Groom at patricia.groom.uel@gmail.com. In the stores you will find a wide range of men's and women's clothing (tops, shirts, sweaters, pants, shorts, outerwear, caps, neckware and accessories) as well as a variety of cases, bags and totes. You have the choice of two logos for embroidery. While the traditional image of the Loyalist Flag with UELAC identification is still available, Land's End Business Outfitters will also offer the cypher or member's badge design for placement on clothing, blankets and even golf towels. Here are step-by-step instructions for ordering (PDF). UELAC has developed a Plaque/Grave Marker to be used primarily to mark the graves of UE Loyalists who have been proven through UELAC. It may be used by the same eligible people as a wall plaque. For details, eligibility and ordering instructions go here. In 2002, the UELAC realized that those of us who are Loyalists or are just interested in the Loyalist era would like more ways to tell others that we are interested in the Loyalist Heritage. At the same time, the UELAC was about ten years from its centennial celebration as an organization, in 2014. There have been and will be other significant dates as well, such as the 225th anniversary of the landing of the Loyalists in 2008/2009, Canada 150 in 2017, and more beyond. The UELAC Promotions Committee was formed and has undertaken to provide a variety of items to us to help us promote the Loyalist heritage and the Association. Profits realized from the sale of items will be used towards some suitable Memorial projects leading up to various celebrations. Many of the items have been or are apparel: hats, jackets, shorts, vests, ties, scarves etc. Other items are for food and beverage, notably the variety of drinking glasses and mugs. Then there is the luggage and valise. Finally , the remaining goods are for display purposes, like the commemorative plate, the crest, sticky pads, vase, licence plate frame and a couple of pins. Items which prove less popular are withdrawn and new items are being added all the time. The primary objective of the Committee is to provide good quality promotional items which we as members, and friends, can be proud to wear, use or display. Any profit which is earned at the end of the year is used for new goods and to set aside to help fund the projects and events leading up to our centennial celebrations. When branches are involved in the sales process, they too earn a small sum which will be likewise put towards branch projects, oriented to preserving and promoting the Loyalist Heritage. As members belong to a Branch, the Branch name can be embroidered on some clothing items for small fee.